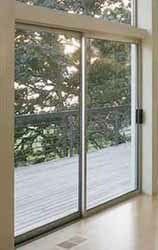 beauty and overall appeal of the Milgard sliding glass door. SPECIFY DOOR SLIDE (HANDING) FROM OUTSIDE LOOKING IN. DOOR SLIDE CANNOT BE REVERSED. Available in heights of up to 8' to meet architectural requirements. NOTES: DOOR FRAME WIDTH 4 5/8"
Available as center slide only. 3 and 4 panel doors will ship open, price does not included field glazing.